no place: no publisher, [1986?]. Four 8.5x11 inch sheets stapled top-left, top sheet yellow cover sheet with facsimile, in-plate signature and reproduction of a painting in black print on yellow paper, second sheet four small reproductions with titles, dates, sizes and mediums, third sheet is biographical information, fourth sheet is a list of exhibits, all appear to be photocopy, mild wear and fold crease. 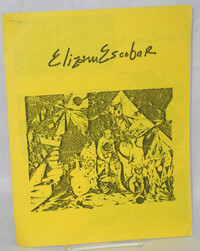 Cheaply-produced (possibly in prison) catalog of the Puerto Rican activist/artist's works created while in prison. He was serving time as an accused member of FALN since 1980 at Oxford, Wisconsin.